Bringing together luxurious materials and an elegant design, the Lush Real Leather Brushed Stool Cream is undeniably stylish. With a winning formula of sumptuous comfort and contemporary style, this is a true champion that is destined for success. Its seat and high backrest have been ergonomically formed and filled with high-density padding for maximum comfort. Both are covered with deluxe cream real leather, featuring eye-catching horizontal stitch detail. A stable hand-brushed steel frame supports the seat, with an integrated gas-lift mechanism and 360-degree swivel movement. For additional support, a rectangular footrest sits securely on the frame. Resting on a heavy, flat, square base, the Lush is finished with a protective underside to help to prevent any marks on your floors. "Easy to assemble and great to look at. Most comfy"
Really pleased with the two leather bar stools that I have recently purchased. Excellent quality and well worth the money - a perfect finish to our new kitchen. Originally purchased two different style stools in order to compare before making my final decision. Return procedure was simple and very efficient and within two days I had the perfect product. Very happy with these stools. Easy to assemble and great to look at. Most comfy too! Absolutely delight with my 4 new breakfast bar stools. The service and delivery was second to none. Delighted with the quality and price for my stools.also. This is the second time I have used this company and cannot recommend them highly enough. 5 star from ordering to delivery. Expensive but you get what you pay for! I ordered 2 of these stools for my breakfast bar to replace my old stools which had been left by previous owner.The Atlantic website makes it easy to choose by refining your order.Few come in brushed steel finish.I was impressed by free next day delivery. I received a call same day after placing order to say the base plate would not be in stock till next day so delivery delayed by one day which was fine.Stools are solid and sturdy and very comfortable. The steel support and footrest are very thick.Heavy stools but not too heavy to move to hoover. You could get similar stools that look good for less but these are quality.Cannot fault stools or customer service. 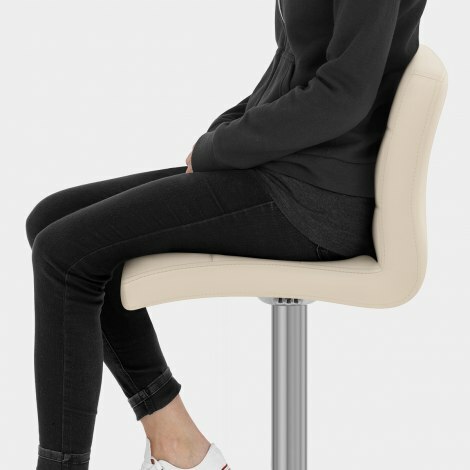 We ordered 2 of these stools for our new kitchen. Absolutely great - easy to put together - we may order 1 more. Delivery was spot on - we were advised stools would arrive within an 1 hour time slot - they arrived within 20 minutes of the time slot we were given. We recommend using Atlantic Shopping - first class.